In April we sold our house in Lynchburg and moved to my parents house. In June we bought 40 acres of land in central Virginia on which to farm and build our homestead. We have been working towards having our own farm for 5 years; since we moved from Goshen, Virginia, where we managed a small direct-market organic vegetable farm. Running Second Nature Garden in Goshen was an incredible experience. Being able to work outside through the seasons and watch things grow is a joy: even when the weather doesn’t cooperate and your back is aching. However, farming is not the most lucrative career path. We realized in Goshen that we would be hard-pressed to make a mortgage payment on desirable farm property in Rockbridge County with what money we made off the farm. So we found ‘real’ jobs and joined the commuting masses. Now we are trying to build up the infrastructure for the farm so we can get back to farming full-time. It will likely take a few years until we are both able to quit our jobs and become full-time farmers again, but now that we actually have the land we can make real progress. The property came with a 1970’s single-wide trailer complete with a working septic and a spring. Electricity runs to the trailer site. The trailer was not livable. We decided to put up a yurt thinking it would be the easiest and least expensive option to get us on the land quickly. Our plan is to live in the yurt for as long as it takes until we can build a small house without taking out a mortgage. 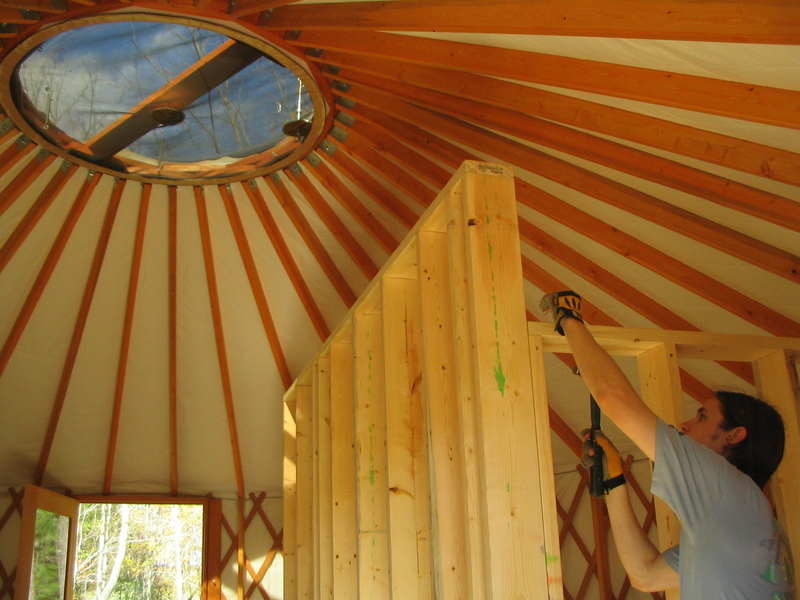 The yurt is 20′ wide, for a total of about 300 square feet. We are looking forward to the adventure of living in a tiny home!